From Ghost Busters to The Godfather, and Dorothy in The Wizard of Oz to Norman Bates in Psycho, here is a collection of the most iconic film moments and characters of all time, expertly built from LEGO. Following the international success of Brick City: Global Landmarks to Make from LEGO (which was translated into fifteen languages), Warren Elsmore returns with even more brilliant unofficial LEGO creations. 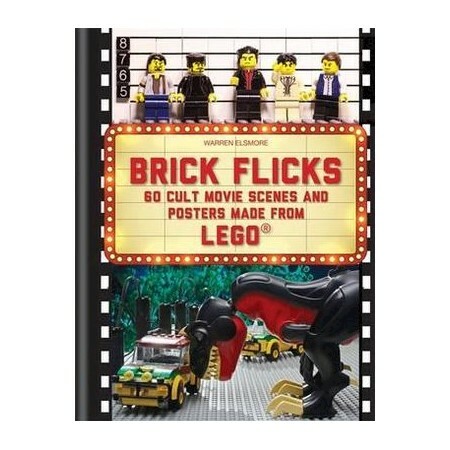 A perfect gift for the LEGO enthusiast and the film fan alike, Brick Flicks contains more than 60 entertaining recreations of favourite movies, from musical numbers and shoot-outs, to romantic scenes and classic poster designs. The full-colour illustrations are accompanied by commentary on how they were made and interesting facts about the movies themselves. There are also instructions on how to replicate many of the scenes at home from your own LEGO collection. Whether you are just a beginner or a more advanced LEGO fan, this is a book you won't be able to put down! Warren Elsmore is a freelance artist and author, who creates unique, one-off, LEGO models for individuals and corporate companies. After spending 16 years in the IT business, Warren now concentrates on LEGO models, building from a studio that would be any childs' dream! Living with his wife, Kitty, in Edinburgh he works worldwide for organisations including LEGO, DELL, BBC, WPP and Visit Denmark. Warren has been a LEGO fan since the age of 4 and has been working commercially since 2012. Now he runs a small team of professional LEGO builders and is world renown for his creations which are occasionally strength tested by his two cats, Io and Callisto.